Who is Stone To Paper? 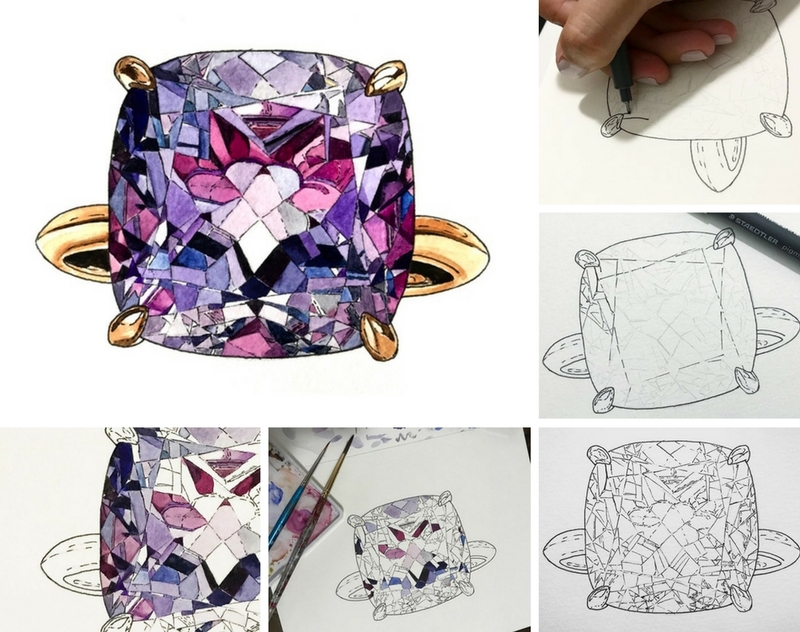 Ángela, fine jewelry on paper as described by herself. Don’t know her yet? Well, you should! Ángela from Stone To Paper is an artist I came across on Instagram. 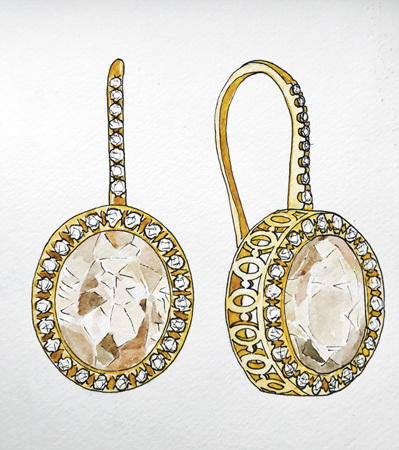 She created watercolor paintings of fine jewelry and they are beaaaautiful, obviously! So I contacted Ángela for a little Q&A to get to know her and her work a bit better. I’ve painted all my life. My dad is a doctor, but his passion is art, so ever since I remember he has used his free time to paint oils. He started taking the whole family to the art studio every weekend since we were little. I started with oils, which I didn’t like, and tried different techniques until I decided what I really like is watercolors. I went to school for psychology, but I realized what I want to do is painting, so I ended up with a second major in art. I always had this dream of traveling and selling my art for a living, I used to see most people doing this would sell bracelets, earrings, etc, so I used to make macrame and beaded bracelets for myself when I was little. 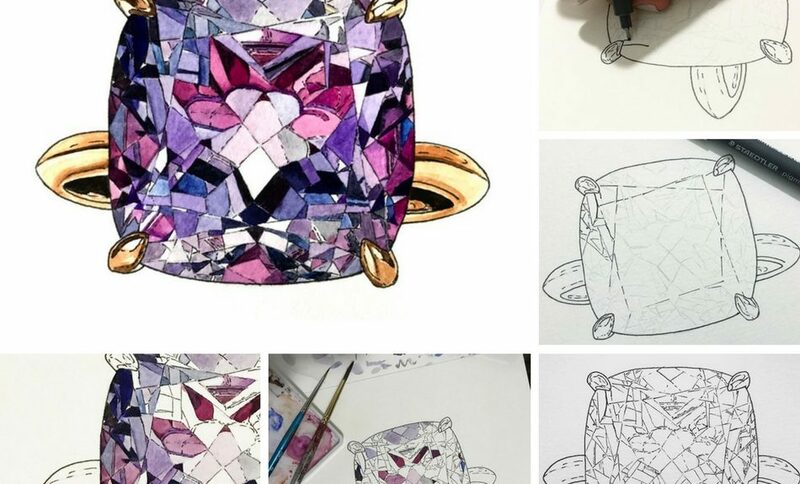 Then, when I started college back in Colombia, I took a jewelry class and learned everything from carving a wax to Polishing the piece, mostly I learned that jewelry is art that you can wear and doesn’t have an expiring date. Which is your current favorite painting you’ve made? 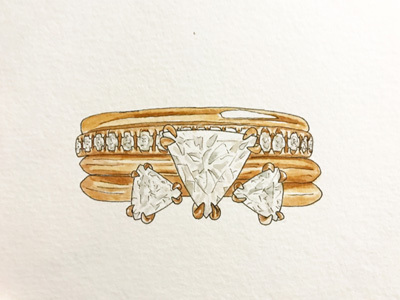 – I love my personal ring stack because my husband and I designed my rings together, so of course, I love them, I also love going back to drawing after a piece is finished. – Definitely also my Debra Navarro rings, I love the organic feeling of her jewelry, and I love how she reacts to my paintings of her rings. What type of jewelry do you like best (to paint)? I like painting faceted, colorful stones. I also like to paint jewelry from the designers I work with, so a lot of the paintings I’ve made are of designs I helped develop and produce. And really any design I like. What do you like about jewelry? I started loving jewelry mostly for the process of making it and because Jewelry is forever, it’s amazing how we can find necklaces, rings, etc. from more than 5000 years ago. Jewelry is art, nature, history, chemistry, culture, emotions, everything together.